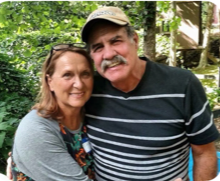 Age 67, of Mount Vernon, OH, formerly of South Webster, passed away on Tuesday, January 29, 2019 at OSU Ross Heart Hospital in Columbus, surrounded by his devoted family. He was born May 22, 1951 in Portsmouth to Lowell “Boots” and Carole (Murphy) Claxon. Tom was a graduate of South Webster High School. He worked for Williams Furniture, Claxon Milk Distributors for 33 years, and American Showa for 10 years, retiring in October of 2017. Everyone knew him as “The Milkman.” He was best known for his contagious smile and boisterous laugh. Everyone referred to Tom as a big talker, but he was a great listener as well. He always took the time to really get to know others and will be greatly missed by family and friends. Tom is survived by his loving wife of 49 years, Joe Anne (Lewis) Claxon; his mother, Carol (Murphy) Claxon; eight children, Casey (Trista McNeal) Claxon, Amy (Bart) Rine, Corey (Darcee Hoberg) Claxon, Shelly (Jeremy) Payne, Wesley (Summer Adkins) Claxon, Lesley (Enid Tidyman) Claxon, Claudia (Cortland) Cook, and Kirby (Kate Swisher) Claxon; eighteen grandchildren, Keith Claxon, Rowan and Hallie Rine, Graci, Bri, Bella, Addison, and Avary Claxon, Mason Payne, Maverick Claxon, Jai, Lewis, T.L., Reid, and Thomas Claxon, Anderson Cook, Harper and Brooks Claxon; siblings, Diana (Stanley) Stonerock, Phillip Claxon, Nancy (Dave) Sparks, Kimberly (Michael) Miller; numerous nieces and nephews who loved him very much, including special family members that once shared his home, Rachel (Ian) Palmer, James “Ike” Lewis, and Daniel Lewis. He was also loved by his Japanese family, Gaku and Reiko. Tom was preceded in death by his father, Lowell “Boots” Claxon and grandson, Bode Williams Claxon. A Memorial Service will be held at 3:00 p.m. Saturday, February 2, 2019 at Bloom Free Will Baptist Church with visitation from 12 - 3 p.m. Arrangements are being handled by D.W. SWICK-NELSON FUNERAL HOME in South Webster. Fond memories and expressions of condolence may be shared at www.DWSwickNelsonFuneralHome.com.